CONTACT RTA WEBSITE BECOME A MEMBER BECOME A MEMBER RTA WEBSITE CONTACT Cahaba Pressure Treated Forest Products Eagle Metal Products East Coast Railroad Gross & Janes Co. Hurdle Machine Works Koppers Inc. CROSSTIES • JANUARY/FEBRUARY 2018 16 RTA CONFERENCE SAWMILL FOCUS Legislation comprehensively revising the Internal Revenue Code passed Congress and was signed by the president in the waning days of 2017. The below attempts to describe relevant provisions and their potential effect on our sector, each company will be impacted in different ways based on unique circumstances. We urge you to consult with your tax planners as this new law moves into the implementation phase. S Corporations & Pass-Throughs The Tax Cuts and Jobs Act creates a 20 percent deduction for the non-wage portion of pass-through income. Senators Daines and Johnson had negotiated a 23 percent deduction during Senate negotiations, but this was ratcheted back to 20 percent, coupled with a lowering of the top individual rate to 37 percent. This blended approach creates an effective tax rate for these entities of 29.6 percent. While this rate is higher than what was promised when leadership and the administration offered its tax reform blue print back in September, it is certainly an improvement over the current treatment of these tax structures. 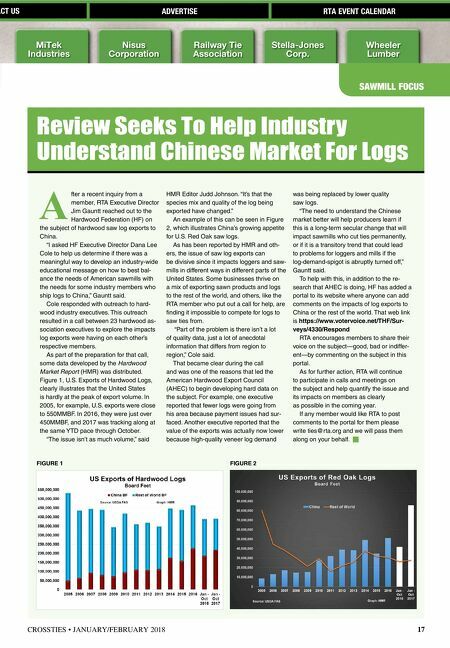 One caveat—service industries are not eligible for the deduction, but that restriction should not affect our hardwood manufacturing facilities. The 20 percent deduction is limited to the greater of 50 percent of a business's W-2 wages or 25 percent of a business's W-2 wages plus 2.5 percent of the unadjusted basis, immediately after acquisition, of all qualified property held in the qualified business for taxpayers with income over $315,000 (married) or $157,500 (individuals). The limitation is phased in over the next $100,000 (married) of taxable income and $50,000 (individuals). Estate Tax The final bill maintains the estate, gift, and generation-skipping transfer taxes (currently at a 40 percent tax rate). For estates of decedents dying and gifts made after 2017, the new law doubles the exemption for all three taxes from $5,600,000 to $11,200,000 per person. The gift and estate tax exemptions would remain unified, so any use of the gift tax exemption during one's lifetime would decrease the estate tax exemption available at death. Net Operating Losses (NOLs) Current law generally permits a taxpayer to carry back a NOL two years and carry forward a NOL 20 years to offset taxable income. Effective for losses generated in tax years following 2017, the new law limits a taxpayer's ability to utilize its NOL deduction to 80 percent of taxable income (determined without regard to the deduction). Additionally, carrybacks of all NOLs arising in tax years after 2017 are eliminated and instead would permit all NOLs in this category to be carried forward indefinitely. Expensing/Cost Recovery The new law allows for 100 percent (up from 50 percent in existing law) expensing for investments in new and used property made after Sept. 27, 2017, and before Jan. 1, 2023. A five-year phase down of full expensing begins in 2023. Sec. 179 Expensing Limits This benefit was made more robust by increasing the limit to $1 million, with a phase-out beginning at $20 million in total qualified property placed in service. The provision is expanded to include property used to furnish lodging and improvements to nonresidential real property including roofs, heating, ventilation and air-conditioning property, fire protection and alarm systems, and security systems. Business Interest Expense This new provision targets interest payments, which companies have been able to deduct from taxation. Under the new law, the amount of interest expense companies can deduct from their taxes is limited to 30 percent of EBITDA or earnings before interest, taxes, depreciation and amortization. This runs through 2021 after which the basis will be EBIT, or earnings before interest and taxes. EBIT is a more restrictive test and will likely increase taxes for companies with considerable depreciation or amortization. State & Local Property Tax Deductions The new law allows individual taxpayers to deduct for tax years beginning after 2017 up to $10,000 for any combination of state and local income taxes, property taxes, and sales taxes. Corporate Tax Rate The final agreement settled on a 21 percent tax rate for C Corporations, a notch higher than the 20 percent rate in both the House and Senate-passed versions. The corporate alternative minimum tax or AMT is also repealed. Inclusion of AMT at a 20 percent rate in the Senate version threatened to undermine any benefits of a newly lowered 20 percent rate for C Corporations. Also notable is that existing tax incentives for standing timber and reimbursement for reforestation costs were left alone by tax writers. All of the renewable energy tax credits in the House version were stripped out in conference. Leadership has vowed to pursue a follow-up package of so-called "tax extenders" to address these credits. HF believed that a "technical corrections" bill would be pursued this year. However, it appears partisanship may preclude any corrections measures from proceeding. This leaves the IRS in the spot where it will have to interpret many of the new law's provisions without more direction from Congress. 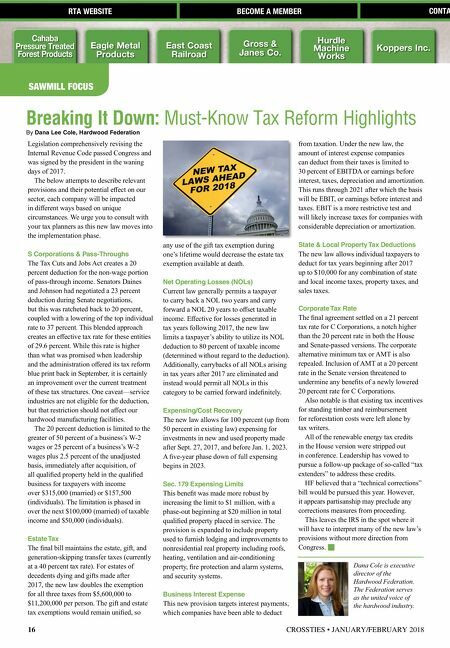 Breaking It Down: Must-Know Tax Reform Highlights By Dana Lee Cole, Hardwood Federation Dana Cole is executive director of the Hardwood Federation. The Federation serves as the united voice of the hardwood industry.